Hey all you lovely book nerds! I come to you with an exciting event today, you know that one book I reviewed last week that was a revamped version of my favorite play “Much Ado About Nothing”? Yea, you know the one. 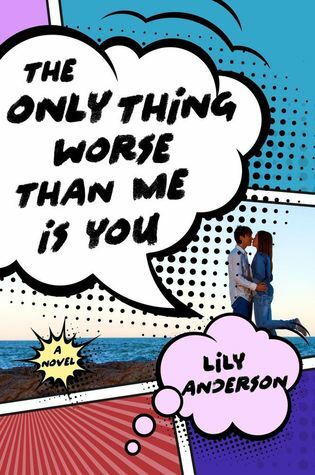 Today I come to you with an excerpt from The Only Thing Worse Than Me is You as part of the amazing blog tour I am so lucky to be a part of. Now for the really, really fun part! I get to share an excerpt with you guys, and I can’t wait. So, without further ado, I give you an excerpt from The Only Thing Worse Than Me is You. I blindly swatted at Harper with my comic book, trying to alert her to the fact that there was a mustachioed moron trying to blend in with the other people entering campus. The mustache twitched an attempt at freedom, edging away from West’s ferrety nose as he tried to shove past a group of nervous looking freshmen. It might have been looking at me and Harper, but its owner was doing everything possible to ignore us, the planter box we were sitting on, and anything else that might have been east of the wrought iron gate. Ben West lurched to a stop, one foot inside of the gate. Even on the first day of school, he hadn’t managed to find a clean uniform. His polo was a series of baggy wrinkles, half tucked into a pair of dingy khakis. He turned his head. If the mustache had been able to give me the finger, it would have. Instead, it stared back at me with its curlicue fists raised on either side of West’s thin mouth. “It is nothing like good cop, bad cop. We’re waiting for Meg,” Harper said, flushing under the smattering of freckles across her cheeks as she turned back to the parking lot, undoubtedly trying to escape to the special place in her head where pop quizzes—and student council vice presidents—lived. She removed her headband, pushing it back in place until she once again looked like Sleeping Beauty in pink glasses and khakis. Whereas I continued to look like I’d slept on my ponytail. Which I had because it is cruel to start school on a Wednesday. My arms flew automatically to cover my chest, but I seemed to be able to only conjure the consonants of the curses I wanted to hurl at him. In his usual show of bad form, West took this as some sort of victory. Kenneth flipped her off absentmindedly as West brushed himself off and darted past Mike Shepherd into the main building. “Brute,” Harper said under her breath. As a rule, I refused to admit when Harper was right before eight in the morning. It would just lead to a full day of her gloating. I hopped off of the planter and scooped up my messenger bag, shoving my comic inside. Harper slid bonelessly to her feet, sighing with enough force to slump her shoulders as she followed me through the front gate and up the stairs. The sunlight refracted against her pale hair every time her neck swiveled to look behind us. Without my massive aviator sunglasses, I was sure I would have been blinded by the glare. “What’s with you?” I asked, kicking a stray pebble out of the way. Unlike the tardy Meg, Harper was tall enough that I could look at her without craning my neck downward. It made it easier to level her with a droll stare. Sometimes, it’s better to save one’s wit and just let the stupidity of a thought do the talking. She rolled her eyes and clucked again, breezing past me to open the door.